Dr Julee Hafner – Don’t Just Talk. Say Something. Don’t Just Talk. Say Something. 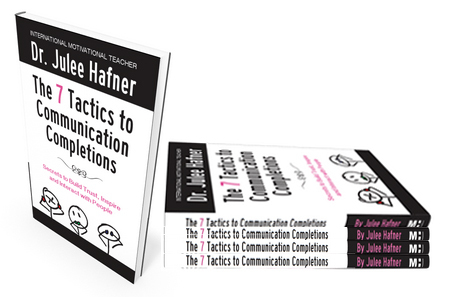 Dr. Julee Hafner is a Communication Strategist who partners with executives and solopreneurs to grow their personal and professional brands, human-to-human. Dr. Julee is an expert whose audiences have fun learning how to stay positive, constructively confront tough communication situations, and work together better. She helps organizations unleash the power of communication to engage employees and drive performance. She shows professionals how to optimize “soft skills” for success in business. Get Dr. Julee’s Latest Book! Conveying your message is essential everywhere. Understanding what makes up productive, meaningful, conversations and reading the non-verbal unspoken messages underneath the spoken words will help you achieve better interaction outcomes. © 2018 Dr. Julee Hafner, Inc.